GOG has launched its Big Fall Sale complete with big discounts and two free games. We're pretty deep into fall at this point and while this is personally my favorite time of the year, even I'll admit that the high point of this season has pretty much passed. The leaves have either fallen down or stopped looking pretty and the weather has shifted from comfortably cool to chilly and muddy. Luckily, not all of autumn's goodness has been spent just yet. We still have some wonderful, huge discount sales to look forward to, right? Heck, some of them we don't even have to wait for. 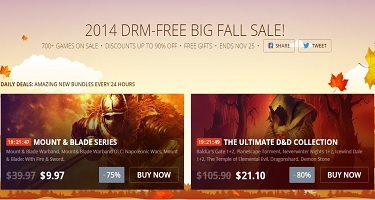 Take GOG's newly launched 2014 DRM-Free Big Fall Sale, for instance. Beginning today and lasting for a week, the digital retailer's Fall Sale is offering hefty price cuts on a number of the game's in the site's library. It will likewise feature flash sales that will further discount a roster of rotating titles at regular intervals. Interested customers will also be able to take advantage of daily bundle deals that package together related games for a fraction of their regular price. The sale's opening day, for instance, is being headlined by sales on a new Mount & Blade bundle as well as a collection of Dungeons & Dragons games. Granted, none of these deals probably mean much if you're one of those types who doesn't want to spend any money at all. That being the case, GOG still might have something to grab your interest. For the first 48 hours of the Big Fall Sale, the site will be giving out free copies of the original Mount & Blade. Registered customers are also being given the opportunity to collect seven free stamps that can then be cashed in for a free copy of The Witcher 2. Claiming a stamp merely requires you to visit GOG and click a button each day of the sale. Just speaking from personal experience, while The Witcher 2 is obviously a fantastic game to get for free, I'd highly recommend people snag Mount & Blade. While its sequel, Mount & Blade: Warband, introduced some substantial improvements over the original, the first one still delivers some incredibly addictive mass scale medieval combat that's made all the better by the many mods available for it. Put shortly, considering the fact that these games are free and require literally almost no effort to claim, there's not really any good excuse to not head over to GOG, grab them and take a look around.